We�ve all seen, read or heard stories about shark finning and the devastating effect it is having on the world�s shark populations. It�s been nearly five years since Rob Stewart showed the scale and severity of the illegal shark finning trade to the world in Shark Water, and demand for shark fin products had been on the increase years before that. But what�s the state of shark finning, shark populations and the action against shark finning right now? The shark fin trade is still the single biggest threat to sharks around the world. The increase in demand for shark fin products has risen dramatically in the past decade, and shark numbers have declined accordingly. 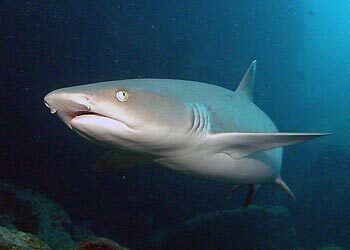 Some estimates by scientists put the decline in sharks around the world as high as 90%. A report released by UK conservation group Traffic and the Pew Environment Group labelled the UN�s shark protection plan, the International Plan of Action for Sharks (IPOA)introduced in 1999, as a failure. �The Future of Sharks: a Review of Action and Inaction� found 20 countries account for nearly 80 per cent of the sharks caught globally: Indonesia, India, Spain, Taiwan, Argentina, Mexico, Pakistan, the United States, Japan and Malaysia. If Indonesia stopped all of its shark fishing tomorrow it would decrease the global catch by a whopping 13 per cent. In 2008, 10 million tonnes of shark fin was exported to Hong Kong, making it the world�s single largest market. Spain was the largest exporter of shark fins to Hong Kong that year, followed by Singapore and Taiwan. The US was ranked 7th, Japan 14th and Australia 20th. 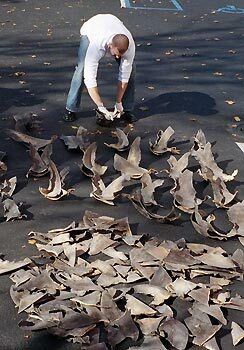 There is a lot of money to be made in shark fins and both legal and illegal operators have profited in this wasteful practice. Just last month the industry�s influence in Costa Rica was shown to still be strong. A judge in the capital city of San Jose issued a temporary three-day injunction allowing three companies to use private docks, from where they cannot be monitored by authorities. While the injunction was only for three days (Feb 4-6), it has shark supporters worried other companies will file similar appeals. Shark finning is not banned in Costa Rica but foreign-flagged vessels were banned from using private docks, where there are no proper customs inspections, in December. While we should continue to pressure countries to ban shark finning in their waters, finning still goes on unregulated and unmanaged in international waters. Many scientists feel the way to combat shark finning is to decrease the demand by making the possession, sale and distribution of shark fins illegal. This is practical in many countries, but in others like China, where shark fin soup is still widely considered a delicacy and part of traditional culture, a total ban is, in the short term at least, impractical. So have we depressed you enough yet? There are some recent success stories that do give us hope. Sharks have never had more supporters and those doing the shark finning have never had so many enemies. Ever since Shark Water�s release, public awareness has continued to grow both in Western and non-Western countries. Celebrities including UK chef Gordon Ramsay, Hollywood actor Edward Norton and NBA all star Yao Ming have all spoken out against shark finning and shark fin soup. US President Barack Obama finally closed the loopholes of America�s finning laws, which were introduced by Bill Clinton but did not apply to foreign registered vessels, in January this year. Hawaii became the first US state to ban the possession, sale and distribution of shark fins. The law comes into effect in July this year. And just last month (February 14) a bill was introduced in California to ban the sale of shark fins. More developing countries are also starting to take a stand against shark finning. These countries, which can find the money in lucrative trades like shark finning hard to resist or lack the resources to stop finning, are now seeing the long-term benefits in healthy shark populations both on an ecological and economical level. The tiny Pacific Island nation of Palau established the world�s first shark sanctuary in 2009, which bans the killing of sharks in an area the size of France. The Fijian coastal town of Beqa, which has become famous for its controlled and safe shark feeds, is a shining example of how the protection of sharks and coral reefs can be more financially rewarding than exploiting them. Headway has also been made in the shark fin soup strongholds of Hong Kong, China and Malaysia. The University of Hong Kong banned shark fin on its campus and Hong Kong Disneyland no longer offers shark fin soup on its wedding banquet menus. 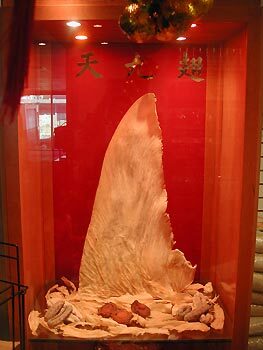 Shark fin soup has been banned from official functions in Malaysia and when Beijing hosted the 2008 Olympic Games more than 20 gold medallists voiced their concerns about shark finning and recorded public service announcements for China�s CCTV networks. Australia, which is a leader in many areas of conservation, is a bit of a mixed bag in terms of the protection of sharks. It is illegal to go out and kill protected shark species, such as the Great White Shark and the critically endangered grey nurse shark, but these species are still suffering by indirect means. Great white sharks have been killed by the so-called shark safety nets and baited drum lines off the coast of Queensland. 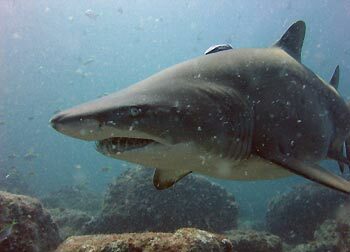 The NSW state government only moved to protect Fish Rock and Green Island, key aggregation sites for the critically grey nurse shark, late last year, with new fishing bans coming into effect on January 28. There has been a commercial fishing ban around the rock and island since May, 2008, but the sharks were continuing to suffer from certain types of recreational fishing. The new rules ban the use of baited hooks over Grey Nurse Shark aggregations from drifting vessels � a practice found to have significant grey nurse shark strike rates. More protection is also needed on the Great Barrier Reef. While shark finning at sea, where the fins are cut off the shark and the carcass is thrown overboard, is banned in Australia, commercial boats can collect fins if they use the rest of the shark. In many cases the fin is the main target, and source of money, while the body is a bit of an afterthought � sold as flake or low-value waste products. While landing the entire shark reduces waste it still allows shark finning to drive the demand for shark fishing. In 2007 and 2008 the Queensland Government commissioned a review of its East Coast Inshore Finfish Fishery, and recommended changes came into effect in July, 2009. It is the state�s third largest fishery (after the east coast trawl and reef line fisheries) and licenses the commercial fishing of species including sharks and rays in the tidal waters from Cape York to the NSW border. Those holding the �S� licence for fishing sharks and rays must now fill out more detailed log books, which will help fisheries scientists better monitor specific species, and their size and catch numbers have been reduced for certain species BUT they can still cut off the fins of many species of sharks as long as they also keep the body. These four species now have specific catch limits and a 600 tonne commercial catch limit applies to all other species (excluding protected species). Operators and conservationist are at odds over whether the 600 tonne limit is too big, or too small. James Cook University researchers, lead by Dr Andrew Tobin, are working on a three-year project funded by the Fisheries Research and Development Corporation to determine the balance between shark fishery catch levels and shark conservation on the Great Barrier Reef. But many would argue the Great Barrier Reef�s sharks cannot wait three years under the current fishing pressures and regulations (when they are followed). Will Dr Tobin�s research be too little too late? *Do not buy flake or other shark products. *Write to state and federal ministers about your concerns. *Support conservation groups such as the Australian Marine Conservation Society. 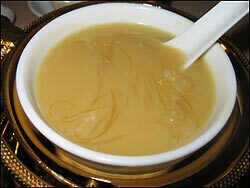 *Approach local seafood restaurants about taking shark fin soup off their menus. Seanna Cronin is a member of the Sarah Shark Team.